A week ago I took my first look at the new Surface Go with an illustrated gallery showing the device, its optional keyboard and its definitely optional pen. And I have to confess that it won me over fairly quickly. Having already opined on the design many months ago, at launch, I can happily admit that some of my fears were quickly dispelled and the Go is now one of my favourite computing devices - it's just so... light and small, yet it's - literally - a full PC. Not quite in my pocket, but close. It's certainly trivial to add to any folio or carry bag. Here's part one of my multi-part review for AAWP. I appreciate that I'm a little late to the party on this - the Surface Go has been available for a couple of months already in many markets. It's been on my radar to test out since launch, but, not being Windows 'phone' related, wasn't top of my to-do list for AAWP specifically. However, the run up to Christmas looks to be quiet on the phone front (especially so in the Windows world! ), so it's time to see how the Surface Go copes with a typical daily workload. Could it be your perfect mobile PC solution? the Type Cover should have been redesigned to retain a full key spacing. It's fine, having used it for a week, I'm now completely used to it, and I appreciate the full key set. the single data port should have been USB-A still (or have Type C as well). I still think this, but I accept that mixing Type A and Type C in the same computer adds technical complications. I've got by with the help of a third party Type C to USB-A-female adapter (and have ordered more). All part of living the dongle lifestyle until Type C becomes truly ubiquitous? And having Type C as an extra charging option has already come in useful several times, being able to top the Go up when I'd left the Surface 'blade' charger back at base. Still, Microsoft should definitely have included a (passive) C-to-A adapter in the box, it's an obvious omission and would have only cost the company a dollar extra to source. Oh well. the bezels were too large. But in fact they're just right - any smaller and use in tablet mode would have been too restricted, since it's harder to hold and move around. And I'm still getting a full 10" display in a form factor which is crazily small and light compared to my ancient first gen Surface Pro. the LTE version looked a long way off. It launched as I write this, but in fact tethering works out cheaper because you only need the one SIM contract. Yes, integrated LTE will be faster, but as long as you're not Bittorrenting or something else bandwidth intensive, then you can easily get work done via a tethered mobile. So, USB adapter necessity notwithstanding (sometimes), I'm getting on fine with this new, re-imagined Surface device. Now, if only I could find trousers or a coat with pockets that did fit this... it's so close! a 'blade' style connector that was easier to locate and insert and which had LED indicators that could be seen whichever way up you plugged it in. The table above shows what's essentially different, but the biggest is price. 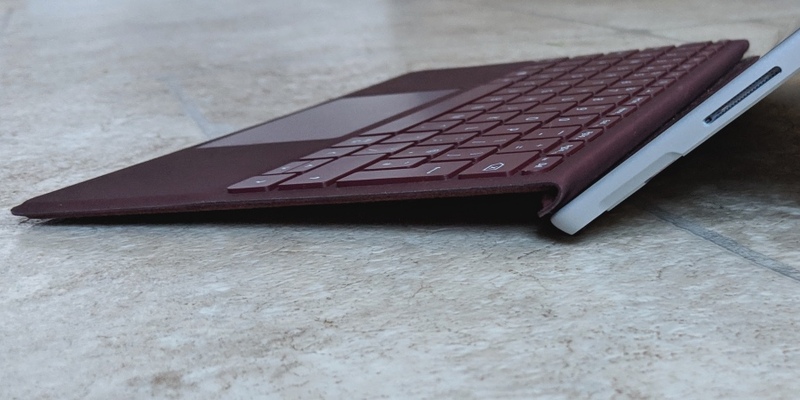 The Surface Go starts* at £480 inc VAT (base spec plus Type Cover) and the top spec is, with Type Cover, £610 inc VAT, while the Surface Pro 6 starts (with Type Cover) at around £1000 inc VAT and goes up to £1900 or so if you increase a few of the specs. It's a very different ball game in terms of money. * I've been a bit woolly with numbers because there are loads of offers, bundles and variations available. So, in short, it depends....! Given that the design, materials and many components (e.g. cameras, hinges, microSD expansion) are the same (heck, the Go's speakers are more powerful), then I contend that the Surface Go is looking rather good value and a natural place to start. Now, the price span of £500-£600 can also buy you a decent traditional laptop, possibly even with SSD and certainly with more ports and general flexibility. You might even get an aluminium chassis if you're lucky. 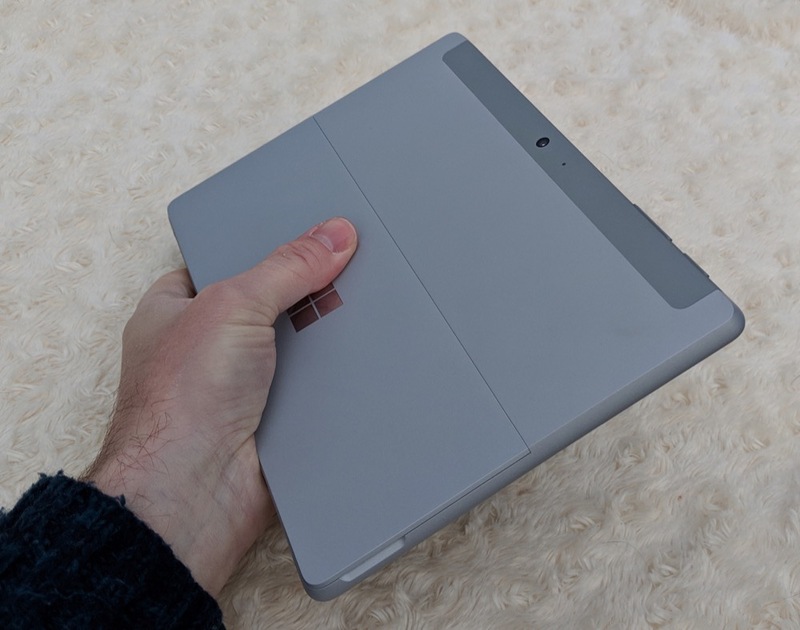 But the Surface Go proposition is that you only ever feel Magnesium or glass, there are no ribbon cables or electrified moving parts (i.e. nothing to break), and the computer is dramatically smaller and lighter. For example, we bought our daughter an Acer Swift i3 for university recently, at around the £500 mark - it's a much liked modern SSD-equipped laptop, but it's almost 2kg, two and a half times as heavy as the Surface Go with Type Cover attached. Phrases like 'two and a half times as heavy' are a huge deal when you're talking about mobile gear, of course. Lug that Acer around and you know you're carrying a laptop, carry the Go around and you only really need a couple of fingers and your thumb, plus it's light enough to fit in any briefcase or folio without you even noticing the extra weight - or size. Given that this is AAWP and that I started these pieces in the context of the Surface Go as a halfway house between a phone-sized communicator and a laptop, I was initially curious as whether the LTE version of the Go (if it ever arrives) will support voice calls, perhaps even forced through a headset or on speakerphone. Many of us receive few calls per day in 2018, so the idea was to have your main SIM in a Go and consider it your all-in-one device. However, this isn't practical - not for physical reasons, I've seen people take calls on phablets that are almost this large! It's important to realise that you're buying quality here - which sounds like I've been got at by the Microsoft marketing team, but it really is true. The Go is machined out of Magnesium (for lower weight), the hinges are super-heavy-duty, the screen's excellent, the speakers (inset either side of the display) are fabulous, even the cameras are pretty good. Given that cheaper Windows tablets and cheaper laptops sound good at the checkout but then disappoint when you get home, it's reassuring how good everything is on the Go. The same applies to the Type Cover, by the way, especially the Precision trackpad, but I'll come to that in a future review part. Somewhat obviously, the Surface Go can be used in two completely different modes: as a tablet or as a laptop. 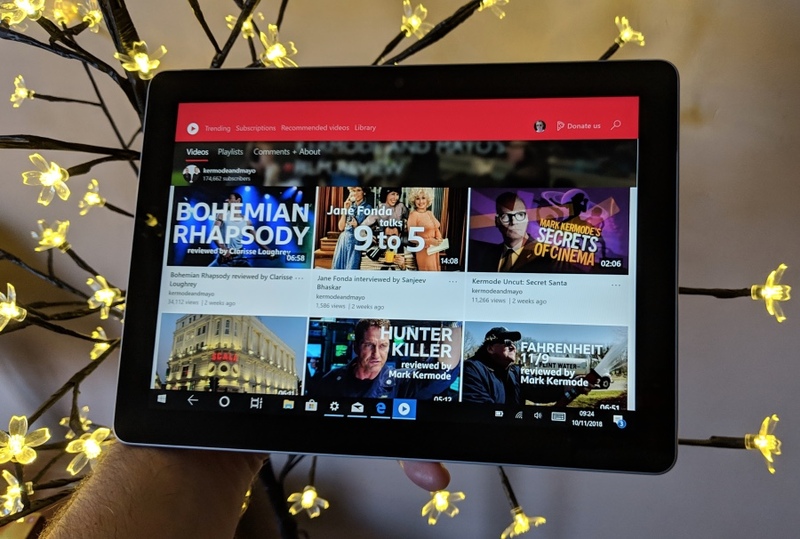 Whereas the Surface Pro 6 is just a little too big and heavy to use comfortably as a tablet around the home or office (think a heavier version of Apple's iPad Pro), so you end up using it as a kickstand laptop much of the time, the Surface Go is genuinely light enough at half a kilo to carry around with a Netflix movie playing or for sofa-surfing. It's barely heavier than the typical 10" iPad and can, in principle, be used for the same activities. OK, perhaps not so much the gaming for kids (though there are good options here), but certainly for browsing and media consumption of all kinds. And if you don't want to hold it in use then there's the variable angle kickstand - you can't do that on an iPad. Plus, for artists, I can see uses in portrait mode with the Surface Pen, using the Go as a lightweight digital scratchpad. The second mode is with the Type Cover attached, obviously, turning the Surface Go into a small and effective laptop. 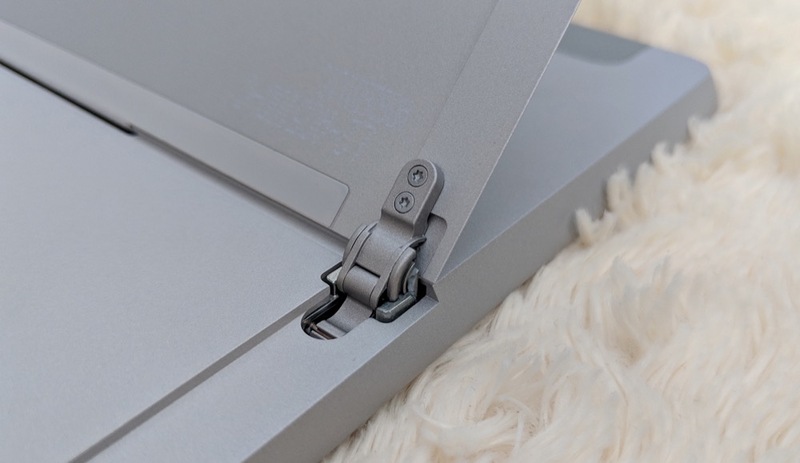 The hinge's 160 degrees or so of rotation means that the screen can be angled back far further than a traditional laptop hinge would allow, which is very handy indeed when space is limited or when you're - literally - using the device on a lap. The Type Cover snaps onto the Go's bottom using two sets of strong magnets - strong enough that you can pick the assembly up by the cover and shake it, and the Go won't come loose. Yet by pulling at one side or another, it's also easy to prise the keyboard loose from the magnetic grip, if and when needed. Eight pogo pins on the keyboard's top edge connect to eight gold contacts in the Go's bottom edge, and that's how power gets to the keys, trackpad and key backlights. Hidden under the kickstand is a microSD expansion slot - this makes a lot of sense, since a card can't get accidentally bumped and ejected while the Go is being moved or carried. I put my 128GB card in from my old Surface Pro and it was instantly accepted. The three main ports are now all on the Go's right hand side. A standard 3.5mm headphone jack makes sense in view of the Go's role as a consumer tablet. A USB Type C port will typically be used for plugging in accessories via a A-to-C adapter (a fiver on Amazon) or perhaps plugging in a Type C hub to connect multiple things at once (including HDMI external display, Ethernet connectivity, plus several legacy USB-A gadgets, potentially all at the same time). Or even, as I had to do, for pouring charge into the Go from a handy phone Type C charger - the Power Delivery standard is embraced, just as on the Type C-charging Apple Macbooks, so I guess you could use one of their chargers too. Finally, there's the Surface Connector ('blade') port, standard since the Surface Pro 3, and this offers much the same functionality as USB Type C, though with some proprietary Microsoft bits thrown in - an official Surface Hub plugs in here, again offering USB expansion, Ethernet, Mini DisplayPort, and so on. I guess that, with both the Surface Hub and a Type C hub plugged in at the same time, you could conceivably have multiple external monitors, four or five USB devices, and wired Internet - all at the same time. I suspect that the Go's processor might start to choke a bit, I'll run some tests, but can't promise anything too extreme. 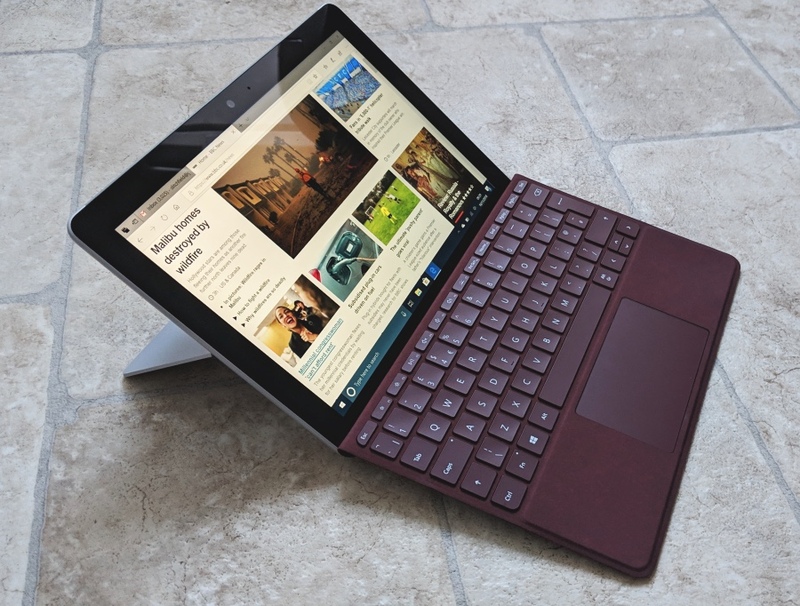 The speed of the Surface Go has been the subject of debate. A lot depends on your expectations and on which variant you have. I've been lucky that the review Go was the 128GB SSD, 8GB RAM version and performance was good, though not super-snappy. A second's extra wait while a web page renders or while Netflix loads (and so on) - I wouldn't call the Go a speed demon, but it got me through several days of work and play without issue. The 4GB RAM, 64GB MMC variant has been criticised for being laggy, but I do note that there's now (on Amazon) a 4GB, 128GB SSD version, which makes more sense. The MMC version will best suit the education market, where the same applications are being run each day and little written to disk. Me, and probably you too, we want to run 'full on' Office applications, browsers with a dozen tabs open, audio and video utilities, and much more, in which case go for the faster SSD option. And, given what I just listed, 8GB RAM will help a lot too - it depends how much you want to attempt to do at the same time. The only speed issue I've had so far has been in powering on the screen. This is because there are varying degrees of 'sleep' that the Go uses - it's a PC, after all. If you've been using the device quite recently then a tap of a keyboard key is enough to bring the Go to life, ditto a press of the main power button on the 'top'. But if it's been asleep for longer then the keyboard press does nothing and then only the power button will work, and with a couple of seconds delay while the Go 'wakes up'. Then if the Go has been 'off' for even longer, you have to wait while it wakes from a low power hibernation state. At least that's my reading of behaviour at the moment, it's early days though, I've only had the Surface Go for a week. It's slightly frustrating to not know exactly what's going to happen when you press a key or button in this regard - and its one way the Go differs from, say, an iPad, which (like a phone) never actually turns off. In part 2 of this review (I'm aiming for weekly instalments! ), I'll look at the Type Cover and assess its use with the Go in 'getting things done', while in part 3 I'll look at Windows 10 itself on the Go, specifically the 'S mode' one-way software switch - what's that all about?